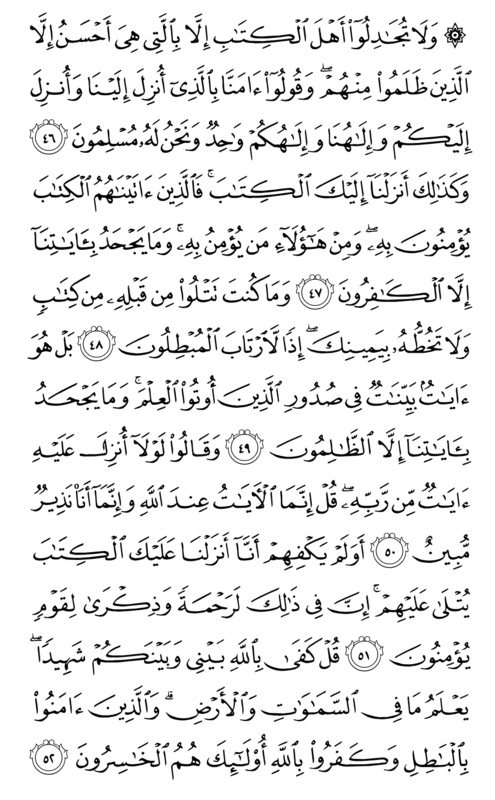 29/Al-Ankabut-46: And do not struggle in any other way but the best with the people of the Book except amongst them who torment, and say: “We believe in that which has been sent down to us and sent down to you and our God and your God is One and to Him do we submit”. 29/Al-Ankabut-47: And thus have We sent down the Book to you. So those whom We have given the Book believe in it, and of these there are those who believe in it (in the Qur’an), and none deny knowingly Our Verses except the disbelievers. 29/Al-Ankabut-48: And you did not read before it any book. And you are not transcribing it with your hand either. If that was the case, the talkers of vanities would certainly have doubted. 29/Al-Ankabut-49: Nay! It (the Qur’an) is the Verses that are explained in the bosoms of those who have been given knowledge. And they do not knowingly deny Our Verses except the wrong-doers. 29/Al-Ankabut-50: And they said: “Should not the Verses (miracles) have been sent down upon him from his Lord”? Say: “The Verses (miracles) are only in the Presence of Allah, and I am only a clear warner”. 29/Al-Ankabut-51: Is it not enough for them that how We have sent down to you the Book which is recited (read and explained) to them? Most surely there is indeed Mercy in this and a reminder (remembrance, Dhikr) for a people who believe. 29/Al-Ankabut-52: Say: “Allah is Sufficient as a Witness between me and you. He knows what is in the heavens and the earth”. Those who believe in the falsehood and disbelieve in Allah, these it is that are in loss.